Rose & Co Blog: Gluten Free Choco-Treats! These little treats could not be easier! 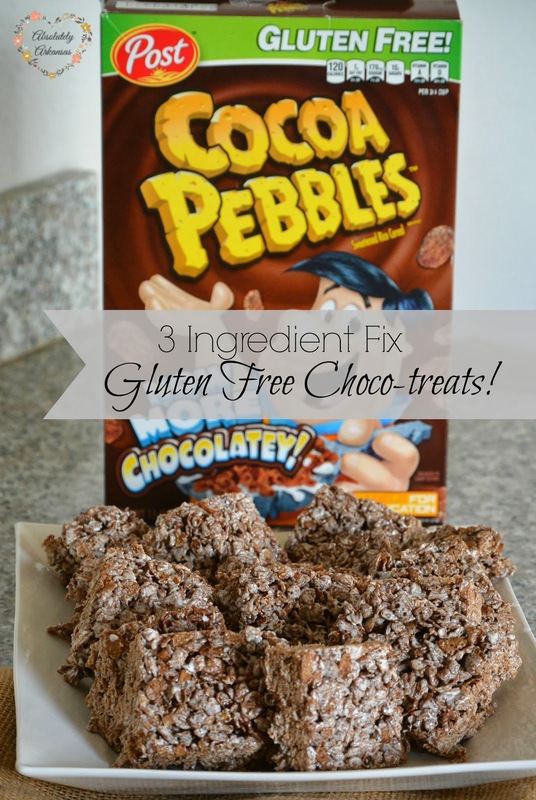 I was super excited to see that Post makes Gluten Free Cocoa Pebbles, too! A Heart Healthy, Gluten Free cheat meal? COUNT ME IN BABY! I know what you're thinking, Marshmallow Creme, whaaaat? I'm not kidding, it works SO much better than regular marshmallows! My treats turn out thick and fluffy with just the right amount of marshmallow "stick". Turn your oven on low, and slowly melt your 4 tablespoons of butter. As it's melting, prepare a baking pan by buttering it and layering with parchment paper. Marshmallow fluff is sticky, ya'll! You'll be glad you didn't skip this step. YUM :) I may have licked the spoon...don't judge. Flip your pan upside down on a cutting board, and remove any leftover parchment paper. Slice into squares and try to eat one or two before your family devours them! Don't forget to come by tomorrow, there's going to be a giveaway! Woo hoo!